Toyota began the Japanese production of its Celica Supra model in 1978 and the car was brought to the United States in 1979. 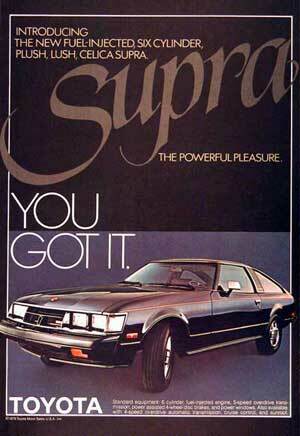 The first generation Supra had a lot in common with the Toyota Celica liftback, except that it was a bigger vehicle with an inline 6 cyclinder engine. Designed as a competitor to the popular Datsun 240Z, the model introduced the North American market to a small yet sporty "pocket rocket" concept. The car also made several technological breakthroughs including being the first Toyota model with electronic fuel injection (EFI). The Mk I versions of the Supra came with either a 5 speed manual or 4 speed automatic transmission and standard 4-wheel disc brakes.